Kelimutu is a volcano on the Flores Island, close to the city of Moni. 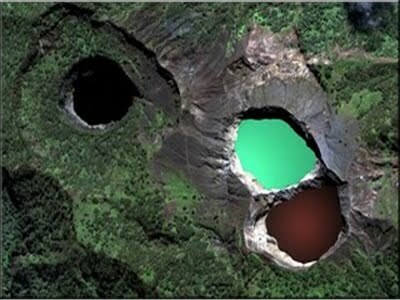 It's most striking feature are the three colored lakes - Tiwu Ata Mbupu, Tiwu Nuwa Muri Koo Fai and Tiwu Ata Polo. They do change color periodically, most likely due to chemical reactions to volcanic gasses welling up from fumaroles. It is possible to enjoy the view of all three lakes in the sunrise from a high vantage point. This is truly a spectacular sight. Around the volcano there are many small villages and fertile rice fields. The volcanic terrain is also worth a view. 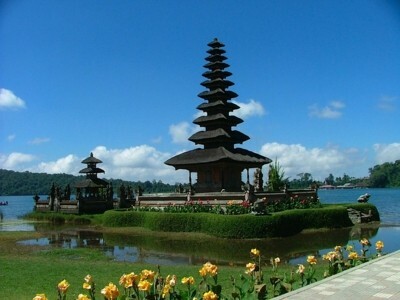 On the island of Bali, there are two major water temples. The Pura Ulun Danu Bratan temple complex is located in the shores of Lake Bratan. It was built in 1663 in order to please the Goddess Dewi Danu with offerings. In Balinese culture she was the ruler of water, lakes and rivers. It was built near Lake Bratan because it is one of the main sources of water on the island, feeding the rivers and irrigation system. The area around Lake Bratan is highly fertile and the lake is also known as Lake of Holy Mountain.